Maracas are percussion instruments traditionally used in Latin and Caribbean music, and more recently included in rock music. 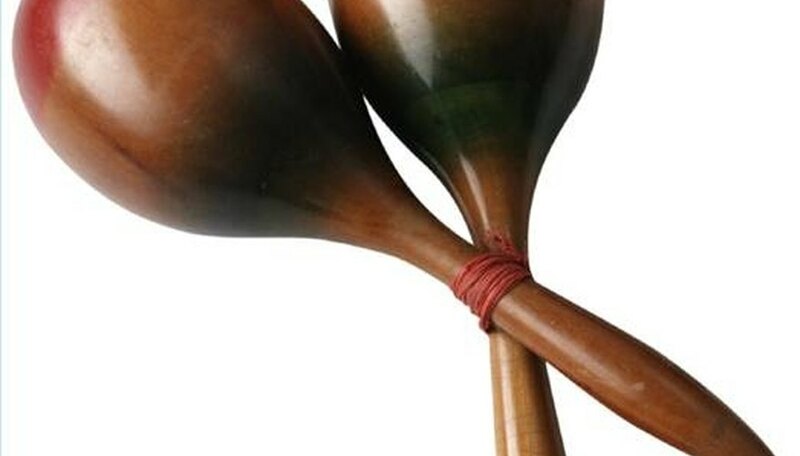 Maracas were originally made out of coconut shells or dried gourds filled with dried beans or seeds. Today, maracas made of plastic, plaster, wood and even hardened leather are common. Using different amounts of seeds, beans or other materials can create higher or lower pitched maracas, or maracas with different timbres (pronounced "tam-bers") of sound. Latin music bands often use maracas tuned high and low to create a contrasting percussion sound. Maracas make noise when the dried seeds or beans inside of them hit the shell. Shaking the maracas quickly results in most of the seeds or beans hitting the shell together, making a louder, shorter noise. Shaking the maracas slowly means that the seeds or beans move more slowly inside the shell, creating a softer, swishing noise. While maracas may look easy to play, it takes practice to make them sound just the right way at the right time. The seeds or beans have to travel a small distance inside the shell, so the player has to anticipate, or play a little bit ahead of, the main beat of the music to make the maracas sound on the beat.